President Moon Jae-in will fly across the inter-Korean border into North Korea for a three-day inter-Korean summit with North Korean leader Kim Jong-un next week, the presidential office said Friday. An advance team will be sent to Pyongyang via a land route on Sunday to prepare for the summit which will be held Tuesday to Thursday. The key events at the summit, from the moment the two leaders meet, will be aired live, according to Cheong Wa Dae. The announcement comes after officials from the Koreas held working-level talks from 9 a.m. at the border village of Panmunjom on Friday to flesh out details of the upcoming summit. The five-hour meeting was led by Kim Sang-gyun, a National Intelligence Service senior official, and Kim Chang-son, North Korean leader’s de facto chief of staff, according to the presidential office. They are believed to have reached a broad agreement on Moon’s itinerary, the sequence of events during the summit, as well as the list of the delegation to accompany Moon to Pyongyang. The two sides agreed to keep the total number of South Korean visitors to under 200. More details are to be revealed in the coming days. High-profile politicians and businessmen are expected to accompany Moon to Pyongyang. Among them are Lee Hae-chan, head of the ruling Democratic Party and former prime minister, and Lee Jae-yong, the de facto head of Samsung Group, the country’s largest business conglomerate. Moon and Kim’s third meeting comes as Moon seeks to act as a mediator to help the US and North Korea find middle ground amid stalled denuclearization talks. At the summit, the leaders are expected to discuss denuclearization, as well as ways to follow through on the Panmunjom Declaration signed during the first inter-Korean summit on April 27 to expand inter-Korean cooperation. 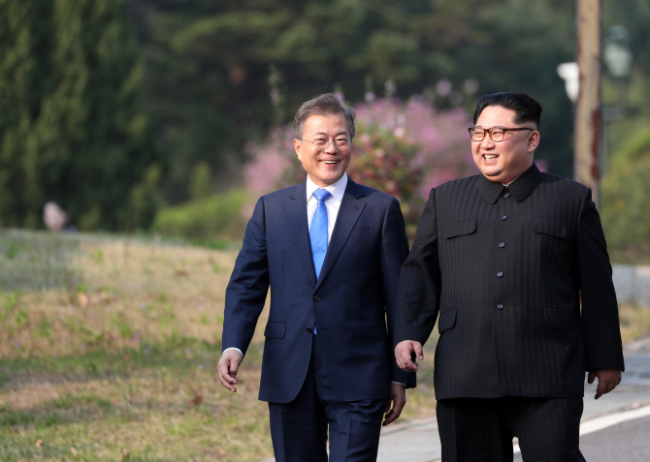 Moon and Kim held their first summit in Panmunjom on April 27 and met for the second time on May 26.